Remember the bagel I talked about on Friday that was giving me the stink eye? I caved and after WW swung by a bagel shop and picked up bagels for the house. 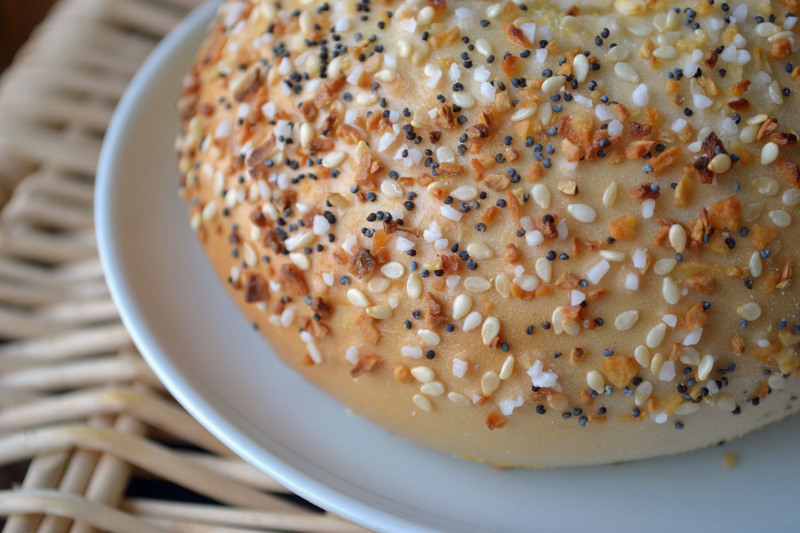 While the jalapeno cheddar is high up on the list – my all time favorite bagel? The everything bagel. I toasted that bad boy up and schmeared it with a little butter and it was worth the 10 points. So after seeing The Sandwich King’s meatball sandwich with giardinera, I knew it was quickly going to the top of my “must make” list. 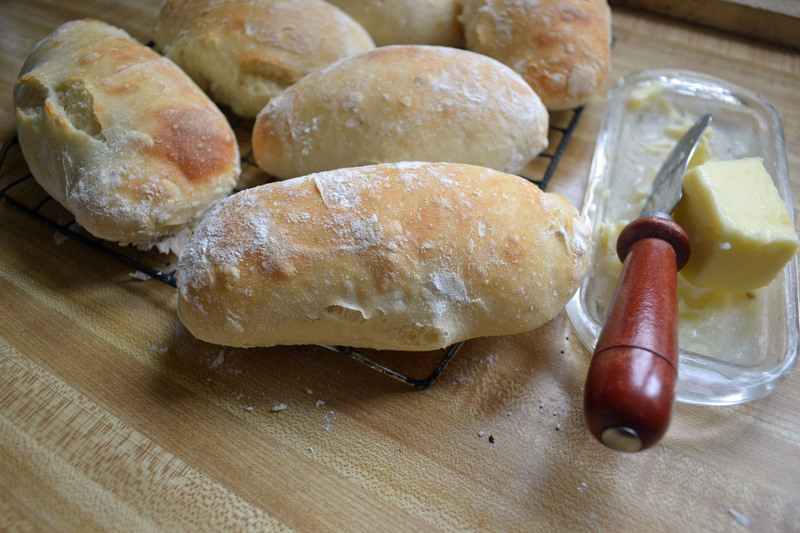 But I decided to make my own ciabatta bread. 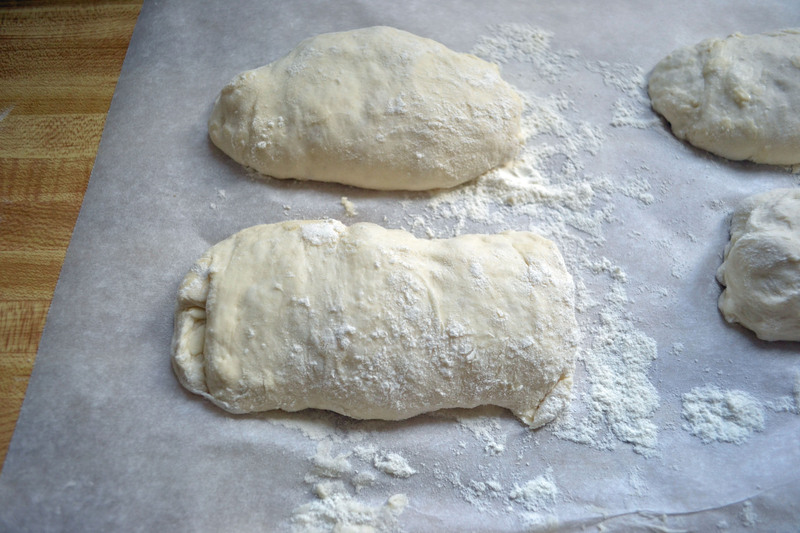 Um, turns out most of the recipes called for a “biga” which is a starter of flour, yeast and water that needs to sit up to 24 hours in advance. 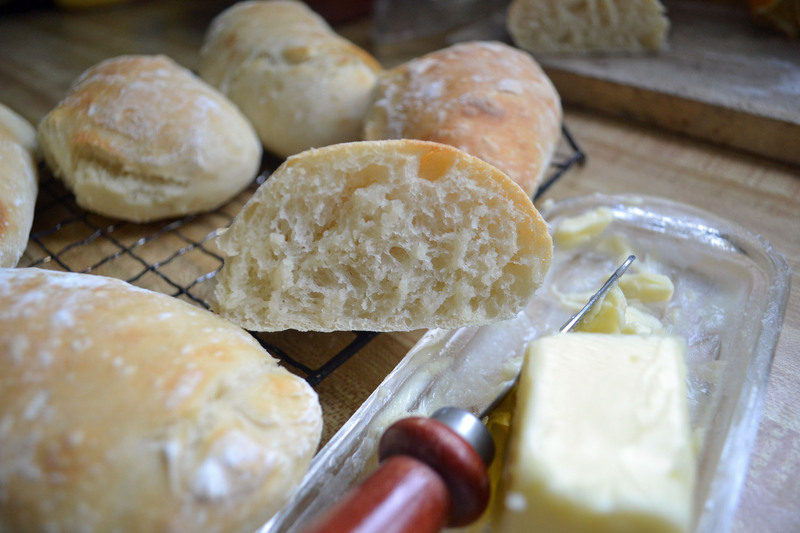 So I was thrilled when I found a recipe for Cheater’s ciabatta at Two Spoons. Instead of making loaves though, I ended up making six sandwich size breads – each one coming in at 5 WW points. Mix the water, yeast and salt together. 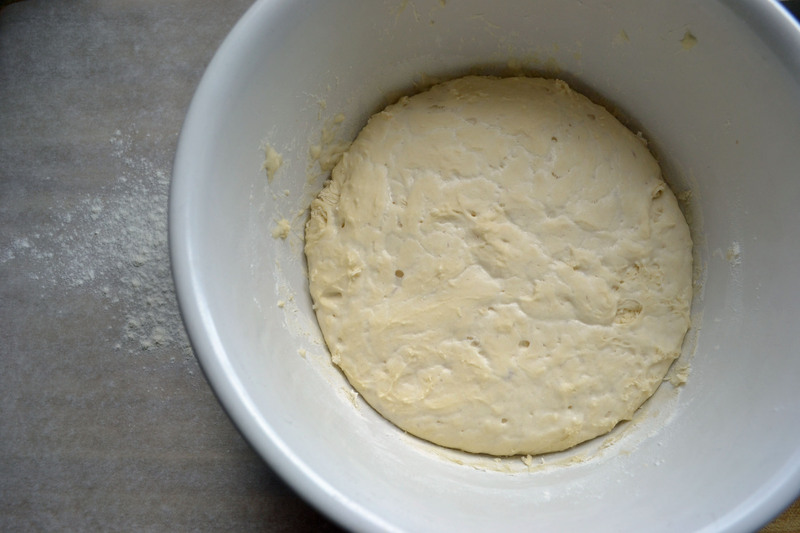 Add flour and mix with a wooden spoon just until all the flour has been incorporated. Let it rise for one hour. After the hour is up, I placed a piece of parchment paper on my counter, liberally dusted it with flour and divided the dough into 6 mini loaves. 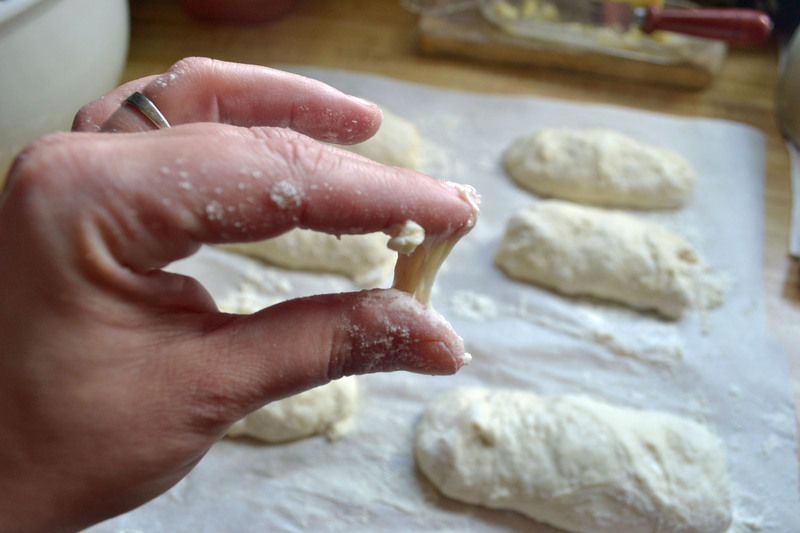 The dough is super sticky – probably the stickiest dough I’ve worked with but try to avoid using too much flour if you can to mold your loaves. Let rise for another hour. Heat oven to 450 with a broiler pan on the bottom rack and a pizza stone on the middle rack if you have it. Transfer the parchment paper to the stone – add 2 cups of water to the broiler pan and shut the oven door quickly. Bake for 20 minutes. See how sticky the dough is? While these were delicious, Tony and I both concluded that it didn’t taste “ciabattay.” Yep, I made that word up. I will definitely try making this again using a biga starter. The inside was super tender while the outside was crunchy. Love. I did adapt The Sandwich King’s meatball recipe just a tad – his original recipe called for five pounds of meat for 8 sandwiches! In a mixing bowl, whisk the eggs, romano cheese, Italian seasoning, garlic and salt and pepper. Add the ground meats and bread crumbs. Mix with your hands (or God-given hands as The Sandwich King states) and combine, careful not to over mix. I cooked mine in about 1 teaspoon of canola oil on medium-high heat – you want to form a crust on the bottom. So with my ciabatta roll, the slice of mozzarella, giardiniera – my meatball sandwich comes in at 13 point. Totally worth it! I made a simple marinara on the side with 1 can of diced tomatoes and 4 roma tomatoes – it cooked down for an hour and I pureed it and added a touch of olive oil, Italian seasoning and salt and pepper. Winning! Tony had asked for German potato salad and I planned on making it. Until I got to the store and was in the check out when I reached into my purse and realized I didn’t have my wallet. Fudge. So I had to drive 15 minutes back to our house, get my wallet, drive 15 minutes back, then 15 minutes back home again, and ran out of time. So I quickly made some onion rings on the side. I had just cleaned out my deep fryer and these turned out so good – there isn’t a lot of breading on these, but 1 ounce of onion rings in WW eTools comes in at 3 points, so I’ll stick with that. That wonderfuly plate comes in at 16 points. All in all though I had 34 points for the day – and still have 41 flex for the week. Nice. 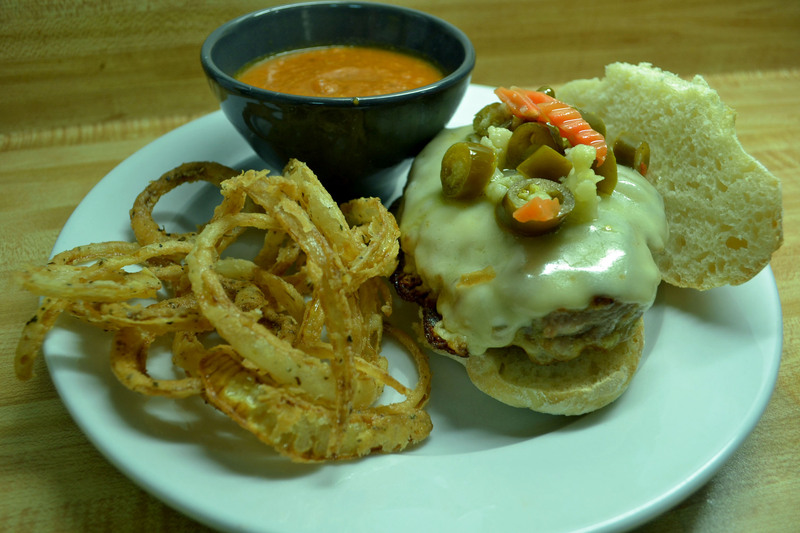 Don’t forget to submit your BSI beef recipes before 9:00 p.m. tonight. The winner will be announced tomorrow. 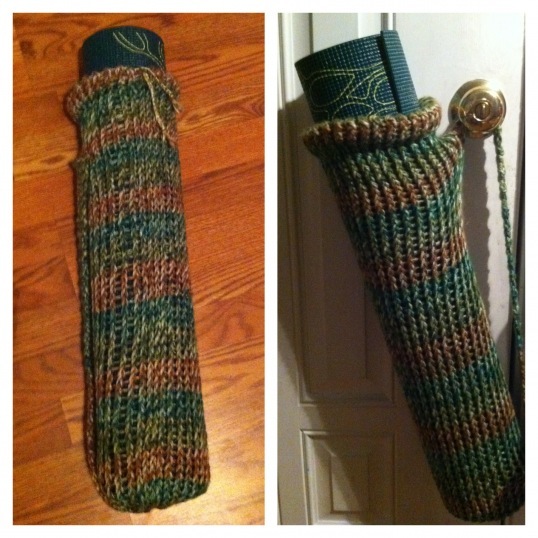 Blog reader Joy has donated the prize this week – a handcrafted yoga mat carrier!